At 10,878 km2 (or 4,200 sq mi) Jasper National Park is the most expansive national park in the Canadian Rockies. It’s located north of Banff National Park, in the province of Alberta, west of Edmonton. The park includes several significant peaks as well as the glaciers of the Columbia Icefield. On warmer days, you can visit numerous waterfalls, hotsprings and mountain lakes. If you are looking for wildlife, good news, the park is home to: elk, caribou, moose, mountain goats, bighorn sheep, grizzly bears, coyotes, beavers, Rocky Mountain pikas, hoary marmots, grey wolves, mountain lions, and wolverines. 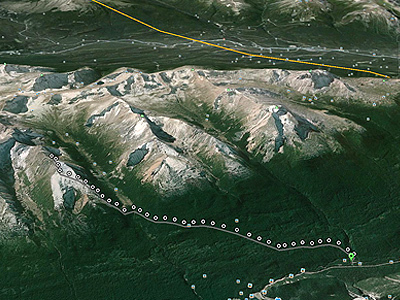 Look for tracks on your next ski tour. Though there’s a lot of cross country skiing available within park boundaries, you can get some good “up and down” travel too. Everything from simple, safe-and-easy day trips to multi-day, epic glacial traverses. Temps can get as low as -40° C and, because it is such a massive park, there’s a wide range of avalanche danger depending on when and where you choose to go. Snow cover varies greatly with elevation. On the ice caps in the park, skiing is possible year round. At lower elevations in the valley bottoms, skiing is best between early December and late March. During the early part of the winter, Parker Ridge is closed until there is 50cm of snow cover. This is to protect the fragile soil and vegetation from damage by skiers and boarders. We have just one route here but hope to add more in the future. The Parker Ridge and Hilda & Whistler Creek regions all appear to offer good backcountry skiing options, as well the potential for significant avalanche danger. Share your experience in Jasper National Park with other backcountry skiers here, in our forums. We want to hear about your adventures in Jasper National Park so don’t forget to post a trip report in the backcountryskiingcanada.com forums. If you have a new route in the area you want to share, mouse-on over here. N-Joy. All routes listed here provided by Peter Amann a frequent user of BackcountrySkiingCanada.com. If we have missed anything please let us know? Views from the summit of this peak are spectacular and unique as the history of the Watchtower Basin goes back a long way to when a cabin was built near treeline. The ski down overlooks Medicine Lake and the peaks of the Queen Elisabeth range with numerous views towards Maligne Lake and west to the Skyline trail. Though not steep, this long cruising ski run drops you back down to the mouth of Watchtower Basin on great open benches and sparse trees where then the trail takes you down through a long traverse. An old horse sleigh can be found part way down the trail that just shows just how long this area has attracted skiers into this great drainage and subalpine valley. ACCESS: Park at the Watchtower trail head just north of Medicine Lake. Follow the trail up for a couple of hours until you break into the main Watchtower valley. Cross the creek and start heading up the drainage that comes out of the cirque to the south. 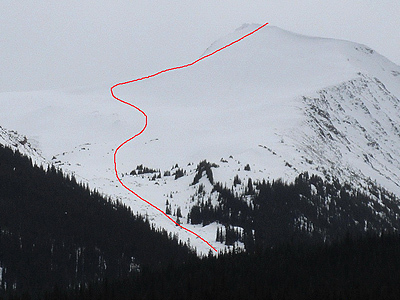 Generally easy terrain leads up to the summit, a small cornice may need to be surmounted. The terrain is not that steep however as always when travelling in avalanche terrain, it requires assessment. This trip is best done in March or later when the snowpack is the deepest and most supportive.